Guatemala, the land of eternal spring, is nestled in the center of the Americas. Here the meeting of the North American and Caribbean continental plates has given rise to volcanic ranges rich with luscious growth, inhabited by a people rich with history and culture. Still recovering from a long and brutal civil war, their greatest treasure is their smiling, enduring spirit. My guide Jeff Neff and I were greeted at the Guatemala City airport by Lorenzo Gottschammer. 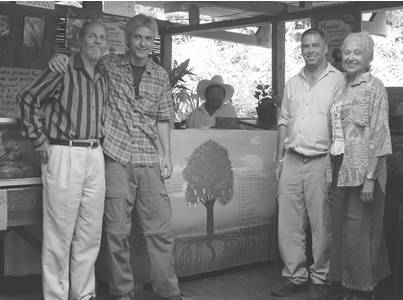 I first met Lorenzo and his wife Emilia in Geneva in 2002 when they were honored with the Medaille d’Excellence for thirty years of work cultivating rapid yielding, genetically diverse macadamia trees. To date they have provided over 150,000 of these hearty trees to the people of Guatemala in a sustainable agriculture and reforestation program that Lorenzo charges with the zeal of Noah. Jeff and I were given our Guatemala orientation as we raced from the capitol to Antigua, then the Valhalla Experimental Station Macadamia Farm. After a delightful breakfast of local coffee, macadamia pancakes with macadamia butter, blueberry jam, and fresh honey, I was beginning to understand Lorenzo’s passion. During our breakfast with Lorenzo and his wife Emilia we began our planning. 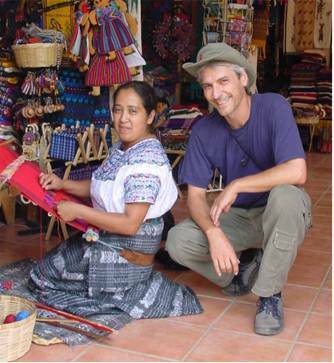 Jeff and I had come to Guatemala on a mission. Jeff Neff is director of MAHAPCA, the Meso-American Health Assistance Project of Californian. 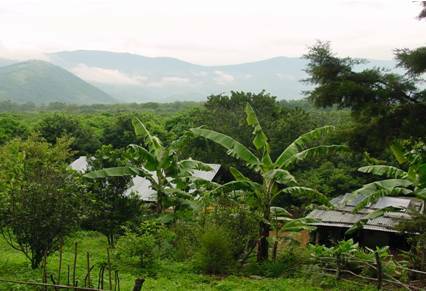 MAHAPCA’s mission is to bring medical supplies and services to Guatemalans affected by HIV/AIDS, especially those in the western highlands. Today Jeff had brought me. I had met the Gottschammers two years earlier at the United Nations in Geneva. I had gone there to promote the work of Hypnosis Health Service and to seek outreach opportunities abroad. The Gottschammers invited me to bring the work to Guatemala. Jeff was connected to a service network. Together, we were already building a strong coalition. Before breakfast had ended a group arrived to tour the farm and experience Lorenzo’s ecology and oil salesmanship. The student group leader, a dear friend of the Gottschammers’, came into the kitchen to take a break. He excused wearing a cap indoors, then lifted it to reveal a bump on his head with black marks around it. He reported that he was receiving radiation treatments for a brain tumor. Upon further discussion, he informed me that he had suffered fatigue after his treatments, so I offered my services to teach him some relaxation and inner strengthening techniques. Emilia set up a special place in her Airstream trailer; I gathered my flute, and within hours of touching down my work was underway. We spent several days with the Gottschammers, during which time we were well educated on the Gautemalan and Mayan cultures, and well fed. We met John Mann, another American expatriot, who facilitates donation and delivery of medical equipment from the US to Guatemala through a program called MESSAGES. John is also a Rotarian and founding member of the Antigua Gaming Society. He proved to be a valuable resource in networking with other active expats, including Jay and Mary Lou Ridinger who have spent the last thirty years revitalizing the mystique and esthetic of Mayan Jade. John also connnected us with La Casa de San Jose, a children’s AIDS hospital, where Psych Dept. director Mario Hernandez enthusiastically welcomed my offer to conduct training in hypnosis and Reiki to his volunteers and Jeff’s partnership in developing resources to continue San Jose’s services. After acclimation in Antigua and Valhalla, Jeff and I embarked on a journey to Proyecto Vida, an AIDS clinic in Coatepeque, a small city on the coastal plain, beyond the western highlands. To reach our destination we took two one-day trips, the first to Quetzeltenango (Xela), the second-largest city in Guatemala, which has retained its highland village character. We arrived after four hours of swaying, climbing, and cramping on Guatemala’s most notorious attraction, the chicken bus. These retired schoolbuses, reborn into public transport service, are ornately adorned and operated through faith and bailing wire. I never quite understood whether they got their name from typical cargo, the compressed loading of passengers, or the favorite road game of the drivers. Needless to say, despite the glorious passing vistas, the greatest pleasure was in arriving safely. We spent the day in Xela shopping in the central park and enjoying the festive performances before repeating the same odyssey the following day. I felt like a diver reaching stages of decompression before final destination. Jeff continued to inform me on each step of our journey, revisiting his past trips and remarking on the changes that had taken place over time. His distracting tales became a good medicine for my overloaded, jostled bladder. In Caotepeque we caught a cab at the bus depot to Proyecto Vida and were met by Coordinadora General, Dee Smith. Jeff and Dee spent time catching up on news and Jeff delivered some research materials and water purification supplies he brought in fulfillment of the mission of his organization, MAHAPCA (Meso-American Health Assistance Project of California). MAHAPCA’s mission is, as stated, to help enhance health, particularly related to HIV/AIDS, in Guatemala and other Central American countries, through resources in California. Jeff had brought some material resources, but he had also brought me, a human resource who had come equipped with skills to help alleviate suffering and maintain vital health through intrinsic (internal) healing modalities. The conversation then turned to the services I could provide the Clinic. I told Dee of methods I could teach for pain management, immune support, and trauma intervention. She asked if I offered any help with stress management for her staff. I realized that even here, at the seeming end of the earth, the demands on providers played a critical role in patient care. Dee invited Jeff to speak to a group the next day about treatment, then helped us to get settled with a nice hotel and dinner. The next morning Jeff and I made our way to the clinic. As we were entering the clinic a cab arrived, delivering an older village woman and a teenaged woman whose arm was in a sling. During introductions we were informed that the young woman had been raped by two men the night before and was brought to the clinic for AIDS testing and support. After the dramatic report, she was taken from the group room to see the doctor. Within a few minutes Dee arrived at the door and called me out of the meeting. She briefed me on the young woman’s condition and asked my advice on intervention. Dee had told me that she practiced Reiki, Japanese hands-on healing. I recommended that she give a gentle Reiki treatment to reorient and restore the sense of human contact and give suggestions that healing would occur over time to both her arm and her heart. We met later for lunch. Dee reported that she had done as I suggested and told the young woman to place her hand on her heart each day and say “I am a beautiful person and God loves me.” Dee said that the young woman and her mother were smiling when they left. We made a promise to Dee and the Proyecto Vida staff to return and teach these methods and many more to both patients and staff.